It’s Sunday Sketchup time! Every Sunday I plan on putting up something I’ve drawn, in one form or another, on the blog. The content will be whatever has moved me during the previous week, and this may not always be travel-related. Ever since Steph and I left on our trip, I’ve been slowly getting back to my roots in the fine arts. For years I was stuck behind a computer, working very little with my hands and even less outside of my office. As we’ve been moving around, the world has inspired me to concentrate on doing what I love, and what I love is to express my creativity. I love photography, and the blog has been a great outlet for that, but I also love to draw, and slowly getting back into the habit of sketching has been really enjoyable, so I thought I would share it with all of you! This will be my last Sunday Sketchup while we’re in Cambodia, so I wanted it to be a fitting tribute to our time here. The tuk-tuks in Cambodia are omnipresent and generally (though not always) run by good natured fellows trying to make a living. The design of the vehicles here is a new one for us, and in fact the idea of the moto as a tractor that pulls various types of trailers seems to be endemic in Cambodia, unlike other SE Asian countries that we have visited. Combine that with the Cambodian tendency to refer to Steph as “lady,” as in: “Hey lady, buy something?” and you have your sketch! Isn’t it interesting that, in practice, referring to a woman as “lady” shouldn’t be slightly insulting, but actually is? Kind of like saying: “You too, buddy.” Buddy is supposed to be a nice term, but somehow you just can’t say it without sounding sarcastic. hihihihihi. <3 I miss Siem Reap. Only rode a tuktuk once though. Oh so true. “One dollar, just one dollar. You buy from me, okay lady?” Cambodians are very sweet people, and I love them dearly, but our first tuk tuk experience when we arrived in Phnom Penh wasn’t so great, but since we’ve had motorbikes for most of our stay we haven’t had to deal with tuk tuks much. lol SO fitting! We love how they always ask but are so passive about it as they continue lounging in their tuk tuk. We were thinking about how annoying it is to be asked every few meters, but then we remembered how difficult it is to flag down a cab in NYC and DC. Will be a reverse-culture shock when we get back! Yeah, it’s easy to get spoiled by choice, but even still having to wave them off every 30 feet gets a little old. At least they are mostly nice about it though. Glad you like the sketch! Another great sketch! While we were in SEA, it was very annoying being asked every 5 minutes if we needed a ride, by the end though we were so used to it that it didn’t bother us anymore. Thanks! Yeah, there are a lot of things you get used to after a while, and then you feel a little weird when they aren’t there. Thanks so much! Fortunately, there have been mercifully few. 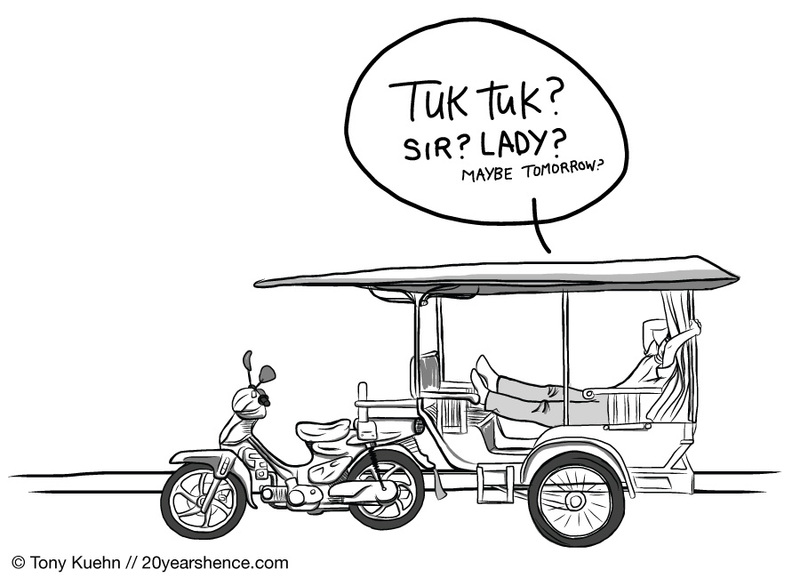 We hate haggling with cabs/tuk tuks more than just about anything! Thanks! New drawing every week, or that’s the plan. Tuk tuks are the norm in SE Asia, but the Cambodian ones are slightly different than the rest. We also have a version of Tuktuk in our country and we call it tricycle and I really love riding tricycles a lot! I have a friend who has visited Cambodia and she told me that at first she thought it was cooler to ride a bike than at Tuktuk… But it turned out that the road is dusty and it will take you 20 to 30 minutes before you reach your destination plust the weather is hot! I wish I could also visit the country next time and I really loved the photos of Angkor Wat that my friend showed me. It’s truly deserving to be a World Heritage Site. We loved the trike drivers in the Philippines! They were always so nice and honest, it was great. Plus, they usually had such fun trikes, custom painted and always unique. It was fun to see how every island had its own style of trike. I agree that bicycling in Cambodia wouldn’t be a lot of fun, even in the rainy season it’s really dusty and hot. Motorbikes are the way to go! Haha, probably not! I’m pretty sure I’ve been called ma’am and Steph has been called sir too. They do their best, right? Even in my head as I read that, “hey buddy” it sounded sarcastic. That’s funny. I know, right? It’s weird how this language of ours works, so many little things that are just impossible to explain to someone who is not a native speaker.